We report a case of a malignant extra-adrenal paraganglioma with an underlying succinate dehydrogenase subunit B (SDHB) mutation in an African patient. The focus of this case is the lack of information regarding the underlying susceptibility genes in patients with paragangliomas and pheochromocytomas in Africa. To the best of our knowledge, this is the first reported case of an SDHB-associated paraganglioma from Africa. Approval to report this case was obtained from the Health Sciences Research Ethics Committee of the Faculty of Health Sciences, University of the Free State (ECUFS 73/2016) and the Free State Province Department of Health. A 23-year-old self-reported African male with an abdominal mass and secondary hypertension was referred to our tertiary hospital for further surgical assessment. His main complaints were palpitations, feelings of impending doom and unexplained weight loss. Further medical history revealed that he had been treated for uncontrolled hypertension for the past 2 months. Both his father and an uncle on his father's side had died at less than 35 years of age from complications secondary to hypertension. No postmortem examinations had been conducted and the cause of the hypertension had not been investigated in these two relatives. On examination, he had a pulse rate of 105 beats per minute and a blood pressure of 160/110 mmHg, which remained high over the next 3 days. On abdominal examination, he had a large epigastric mass which was firm, non-tender and immobile. The rest of his examination was normal. The patient underwent extensive special investigations to determine the underlying cause. The 24-hour urine normetanephrine level was 141 881 nmol/24 hours. A CT scan showed a 9.1 x 10.2 x 6.3 cm retroperitoneal mass that stretched from the level of the aorta bifurcation into the porta. There was abutment of both his renal arteries, superior mesenteric artery and the abdominal aorta. The CT scan also showed lytic lesions involving the right sacroiliac joint and T12 vertebral body suggestive of metastatic disease. All other investigations were normal. A diagnosis of a malignant extra-adrenal paraganglioma was made. The patient was prepared pre-operatively with crystalloid volume expansion and started on doxazosin, a selective alpha 1 blocker, and amlodipine, a calcium channel blocker. Once the patient was alpha blockaded (defined as experiencing orthostatic hypotension), he was taken to theatre. An explorative laparotomy was performed. The tumour was found to extend from below the aorta bifurcation up to the third part of the duodenum with infiltration of the serosa of the duodenum. Laterally it abutted both renal arteries and the inferior vena cava. The tumour was macroscopically resected, together with the third part of the duodenum, which was reconstructed with an end-to-side duodeno-enterostomy. No hypertensive episodes occurred during manipulation of the tumour prior to removal. Once the tumour was removed, the patient developed hypotension, for which adrenaline and phenylephrine were administered. Post-operatively the patient was taken to a surgical intensive care unit and kept intubated until the following day. The duration of the procedure was 380 minutes with a total blood loss of 1 200 mL. Following surgery, the patient underwent a whole body MIBG and SPECT/CT, which confirmed multiple skeletal metastases. Histological examination of the resection specimen demonstrated a paraganglioma which had invaded the wall of the small bowel. No tumour was noted in the lymph nodes, but there was tumour present on the surgical margins. The patient's symptoms and hypertension, however, resolved. Taking into account the patient's age, family history, the size of the tumour and the presence of metastases, the specimen was referred to the Department of Pathology at Brigham and Women's Hospital, Harvard Medical School in Boston, Massachusetts, for immunohistochemistry for succinate dehydrogenase subunit proteins, as this was not available in South Africa at the time. 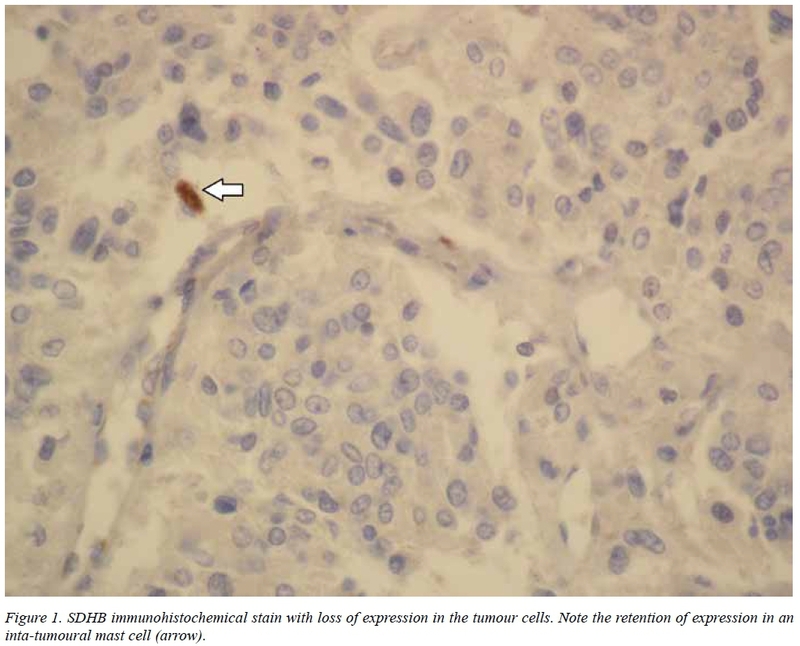 The tumour cells showed loss of expression of SDHB (Figure 1) and retention of SDHA expression suggesting an underlying SDHB, SDHC or SDHD mutation. Sanger sequencing confirmed a novel SDHB mutation. The patient received genetic counselling and was then referred to the Department of Nuclear Medicine for 131I-MIBG therapy. His family has also undergone genetic counselling and clinical evaluation, but no additional family members with paragangliomas have been identified yet. Germline mutations in the SDHB gene are known to increase the risk of malignancy.3 With most population-based studies regarding susceptibility genes coming from Europe and the United States, no literature on the occurrence of specific genetic abnormalities in PGLs/PCCs in the African population is currently available. Although studies on pheochromocytomas have been reported,6 no relevant studies on the incidence of paragangliomas in Africa could be located in the literature. The percentage of tumours with an underlying mutation and the profile of these genetic abnormalities in this population are therefore unknown and require further investigation. Identification of these susceptibility genes would allow clinicians to manage these patients more appropriately with more accurate prognostic information. It would also identify those patients whose families should be sent for genetic counselling and testing. Any family members found to have mutations should then undergo regular tumour surveillance. Immunohistochemistry for SDHA and SDHB has been added to our diagnostic platform and is now performed routinely on all PGLs and PCCs received. In addition, a project is currently underway in which next generation sequencing will be performed on 96 cases of PCCs/PGLs to determine the profile of mutations in the South African population. Dr. Daleen Struwig, medical writer/editor, Faculty of Health Sciences, University of the Free State, for technical and editorial preparation of the manuscript.